Here's a card I created using a bunch of my favorite Tim Holtz products....dies, inks, stains, crayons, and stamps! 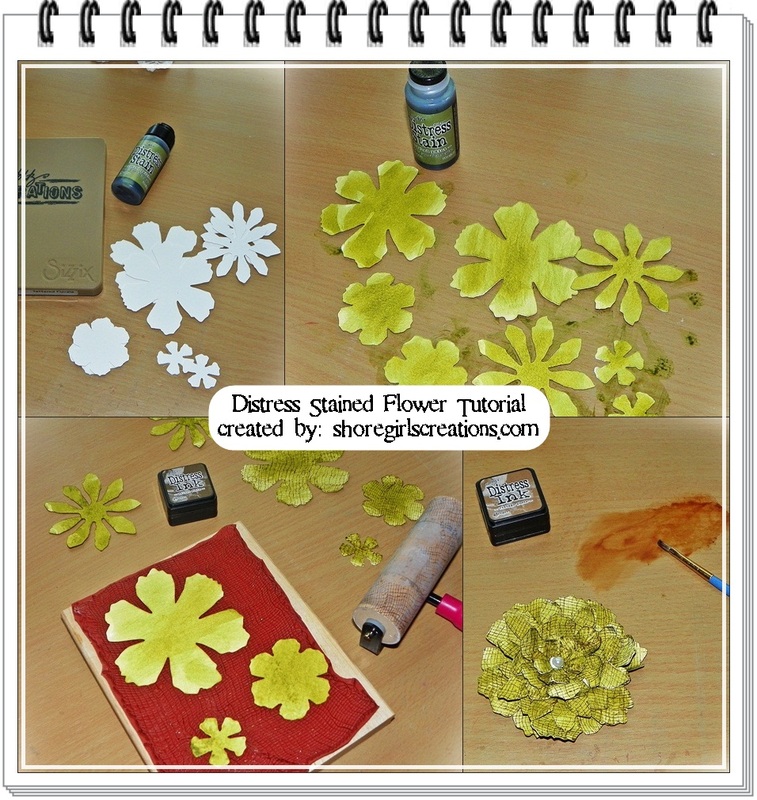 I'm also sharing a mini tutorial on creating the jumbo flower with the Tattered Floral Die. 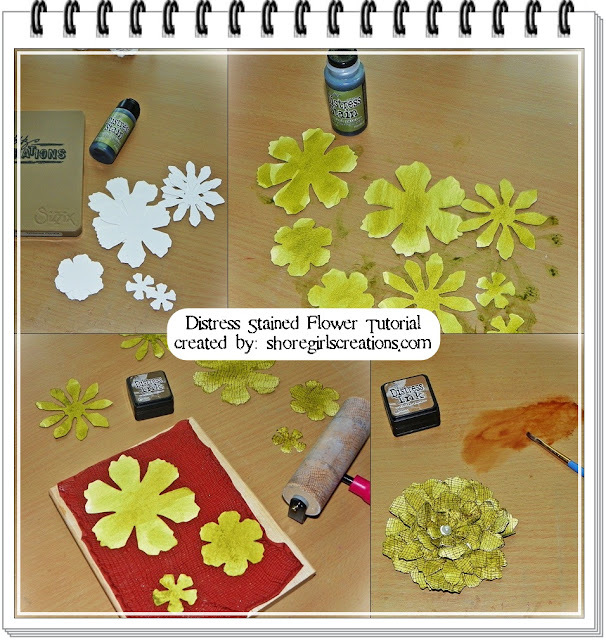 Note #3: You can change up your flower by using different colors for different layers, stamping a variety of background stamps on them, and lightly painting diluted complementary colors on your assembled piece — The sky’s the limit so use your imagination and let your creativity soar. To create the background for my card I masked off the left side of my card stock with a torn piece of computer paper and stamped the script stamp from Stampin Up in Walnut Stain Distress Oxide. Next I layered stamps from Bitty Grunge (Tim Hotlz) and Flights of Fancy (Tim Holtz) in Worn Liptstick and Peeled Paint Distress Oxide. I inked all the edges in Walnut Stain and distressed them before adhering the panel to my card front. The foliage is a mixture of Holiday Greens Thinlits (Tim Holtz) and Leaves Galore (Tim Holtz) dies. I colored my leaves using distress crayons. To finished off my grungy/spring card, I added a stamped panel to the inside that matches the front of the card. 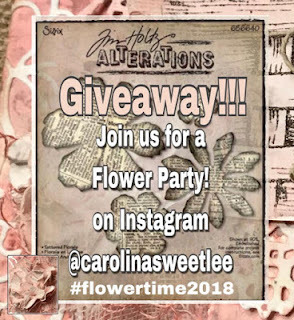 I'll be linking this up to Carol's (carolinaswettlee on Instagram) #flowertime2018. 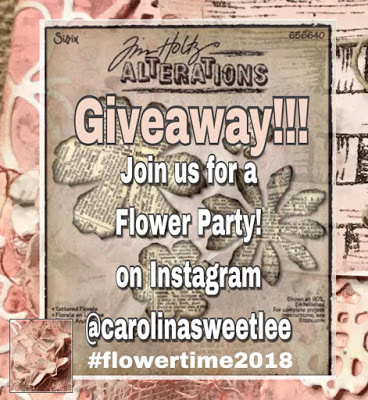 She's doing a giveaway of the Tattered Floral die - you can enter that HERE. Esther, this is such a stunning card - inside and out! Love that dimensional flower! Thanks for playing along with us at Inspired by All The Little Things! Oh but this tattered bloom is a stunner! Thanks for sharing the tutorial on it. The inside of your card is just as stunning as the front. Love it! 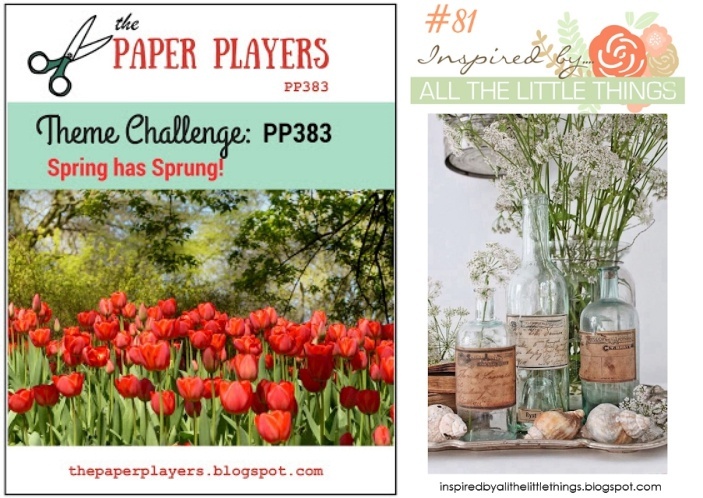 Thanks for joining us this week at The Paper Players. This is gorgeous Esther!! Love your large bloom with all of the vintage texture- perfect for all of the challenges!! Hugs and thanks for inspiring all of us! Oh, this is beautiful! Fabulous take on the inspiration photo! Such a beautiful flower card, Wsther! Love love love the 3D bloom and how add texture on the petals. Great technique fpr creating the vintage/grunge look. This card is absolutely amazing, so glad I spotted it at Inspired By All The Little Things! This would be good for a POTW also. Oh wow that is stunning, I so love the vintage feel to it, great look of texture on the flower and love the colors, lovely arrangement, has that great shabby chic feel to it, the inside is so nice it would look great as a card front too! Such an appealing color combo on this card! GORGEOUS! Thanks for playing and sharing this with us this week at the Players, it's just delightful! What a gorgeous shabby-chic card! Your layered bloom is just beautiful, and I love how you stamped your background. Thanks so much for sharing with us at The Paper Players, Esther! GORGEOUS inside and out! Love this big bloom! Thank you for playing along! Gorgeous take on the inspiration! Love the dimension! Thanks so much for playing along with us at Inspired By All The Little Things!